If "seeing is believing," and "a photo is worth 1,000 words," we hope you'll enjoy the photos in this section of our web site. Truth is, nothing compares to the sights and adventures aboard the Schooner Mycia. See and sail for yourself! Photo: Schooner Mycia sails around Point Wilson. 8) Schooner Mycia Sailing Adventures 2010: Fourteen pix from summer sails in the Pacific Northwest. 7) Surfing in Sitka, Alaska - April 2009: Five photos of surfing fun in the North Pacific. 6) Schooner Mycia Sailing Adventures 2008: Twelve photos from our summer fun. 5) Wooden Boat Festival 2007: Eleven photos taken by Korina at the 2007 Wooden Boat Festival. 4) Nature & Art: Twenty-one photos of nature and art from Mycia sailing excursions. 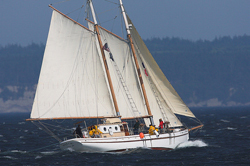 3) Mycia Pix: Twenty photos of the Schooner Mycia - inside and out. 2) Summer 2004: Eleven images from a family trip to Alaska in July 2004. 1) Photo Gallery #1: Twenty-page "Quick-Click" gallery of various images from Mycia adventures. We invite you to sign-up for our free newsletter and to contact us to discuss your adventure ideas.